This will compile, but it will fail because the controls will never be NULL. In my opinion it is a flaw in the .NET Interoperability implementation, but it could be argued the other way around (like, for example, that the CurrPage.Name is just a placeholder for a control, but that explanation would not hold up against the whole concept of how you are accessing and interacting with the controls). Whatever it is, a bug or a feature, it does not work and you need to do something else. This makes sure that you only access the control add-in if it has been instantiated. 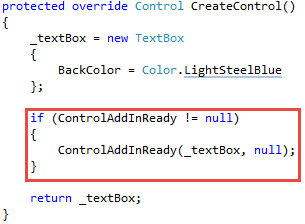 This is a standard event-rising pattern in C#, and it compiles, and executes nicely, however, when this code is hit, the ControlAddInReady is indeed null, and no event handlers are attached to it, therefore, the event never fires. Let me first explain why it never fires. 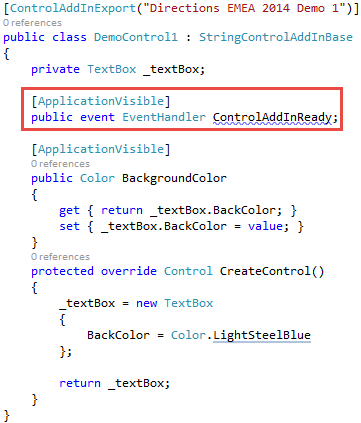 When the extensibility framework calls the CreateControl method, it may not yet have completed the rendering of the page, and therefore the C/AL event triggers for the control events (such as this ControlAddInReady event trigger) on the page have not yet been bound as event handlers for events. This binding may happen at a later stage, after the CreateControl has already completed its work. Now, I said “may” two times, because depending on how exactly you implement your control (which class you inherit from or which interfaces you implement), it may or may not be true. Again – this could just be another bug in the extensibility framework, or another feature which you have to cope with. In any case, just checking if ControlAddInReady is assigned will not do the trick, as in most situations the event handlers are just never assigned when this block of code is hit. And now let me explain how to implement it properly. 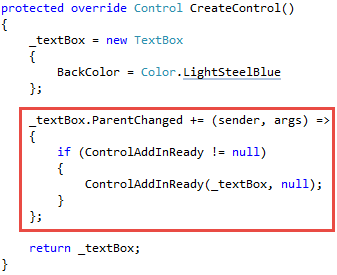 And when you do it like this, you fire the ControlAddInReady trigger when the parent of the _textBox control (or whichever other control you instantiate) changes, which is at the time the control is actually placed on the page. Thank you Vjeko, this works. Now I only have to find out how to resize the panel dynamically. @Gunnar: what do you mean by this? Responding to the resize event of the page, or being able to programmatically define a new size and then have the page resize accordingly? 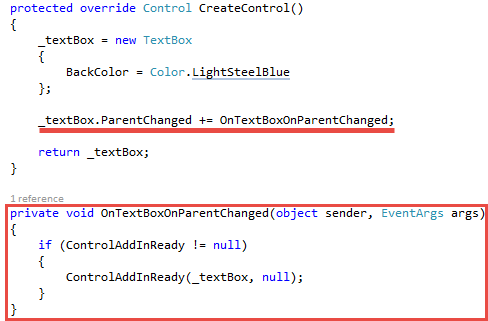 Thanks for explaining this Vjeko – I’ve used this code for a while (I think it’s part of Christian’s VS Templates http://blogs.msdn.com/b/cabeln/) but not really understood the ParentChanged bit. Now, can you explain why sometimes ControlAddInReady is fired twice? I don’t know the exact sequence of events that may cause the ParentChanged event to fire multiple times. However, Vjekoslav mentioned at Nav Techs Days last week that it is better to subscribe to the HandleCreated event. This is guaranteed to fire only once and to will not throw an exception because the object has not been instantiated. I also don’t know the sequence of events that can result in this, but HandleCreated is only going to be fired once per control. This is a hint from Arend-Jan Kauffmann, by the way – not my idea, so credit goes to him. I have checked so many documentations on this and they say NOTHING about this strange events behavior. I believe I lost a good amount of my hair while trying to understand what was wrong. You, sir, are my hero. Absolutely. Take a look at my TechDays sessions of 2015 and 2016, and stay tuned for the demos of TechDays 2018, there will be a lot of these examples.